Some people say that 666 is the devil’s number. Or that when you see 11:11 on a clock, someone is thinking of you. 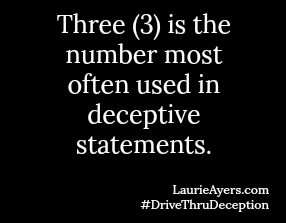 In deception detection, the number three (3) is a liar’s number. On December 10, 2017, CBS Minnesota News reported that Chicago police said a man and woman from suburban Minneapolis falsely claimed they were robbed at knife-point of a $12,000 engagement ring and other items. “The pair told police they were downtown Chicago early Thursday when three people approached them with a knife. They said the robbers took the ring as well as a laptop, suitcase and an iPad Mini. Further, in February 2018, a Texas woman plead guilty to lying to police when she said she had been kidnapped and raped by several black men. She told police that three black men in ski masks had abducted her and that one of the men held her down while the other two raped her. She was cut by a knife when she tried to get away, she said. Two weeks later, she confessed to police that she’d made up the story and that cuts on her body were self-inflicted. Interesting for sure but why is the 3 significant for lying? I guess it is a 3 in any digital sequence? “Some people view the number three as being a complete number as in “Life, Birth and Death” or “Body, Mind and Spirit.” We also have three primary colors which all other colors come from. 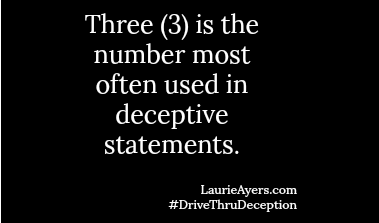 It may be that when deceptive people use the number they feel they are giving a whole and thorough number.